A failure analysis was carried out on an A213 T91 secondary superheater tube after 4 months of overhaul. The failure caused the 600-MW coal power plant was shut down. The investigation consisted of visual inspections, microstructure analysis, Vickers hardness test, x-ray diffraction, and ash fusion temperature test and ash content analysis. The failed tube had a thin-lip rupture with sharp edges and experienced a decrease in hardness in the area of lip rupture. The microstructure analysis shows the coarse carbide and some isolated voids. 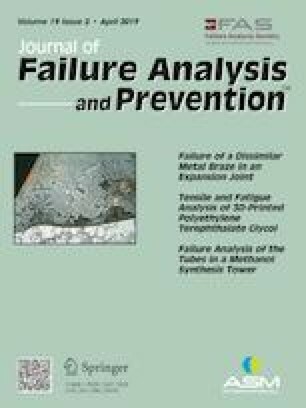 Corrosion products were detected in slag deposits, and nonuniform thin oxide layer in the inner wall of the tube was observed. It is concluded that the main failure of the failed tube was due to the formation of slag deposits on the outer surface of the tube wall. This formation has resulted in simultaneously occurring phenomena, which was the localized flue gas erosion followed by the rapid overheating of the tube. The formation of slag deposits was in consequence of the use of coal with lower ash fusion temperature than required coal ash fusion temperature for the power plant.